This is the first of many more Wedding Mondays!! If one or both of the couple live any where in Georgia and have a valid Georgia ID then they can get their marriage license from any county probate court. If however, neither of the couple live in Georgia then they will need to get their license in this county, which is Chatham County. The phone number to the court house here is: 912.652.7267. If you are getting married in South Carolina, the phone number to the court house on Hilton Head Island is 843.341.8413. Both bride and groom need to be present when obtaining their license. If you get a marriage license in South Carolina it can only be signed in South Carolina. 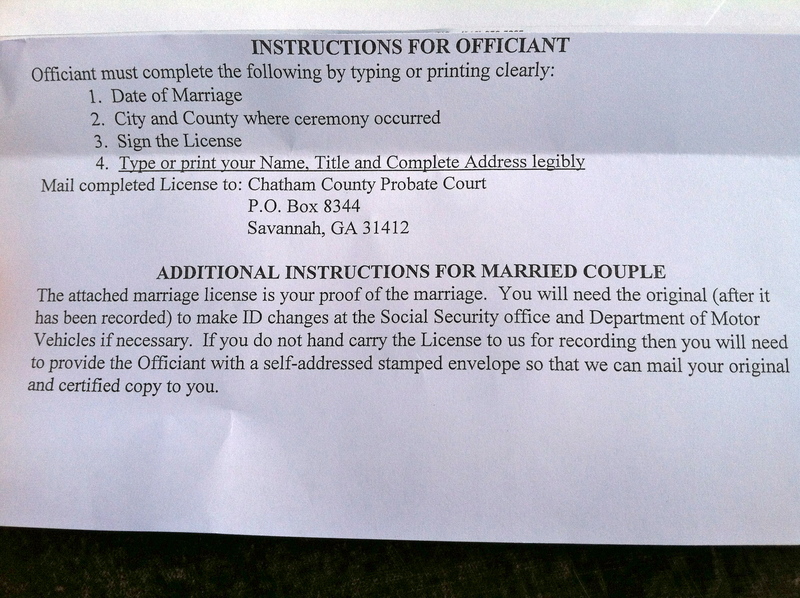 Likewise, if you get a marriage license in Georgia, then the ceremony must take place in Georgia. Once the license is signed, it can either be taken in by you the next business day, unless you get married during business hours, or it can be mailed in. If you mail it in, you will need to provide them with a self-addressed stamped envelope so they can mail you the certified copy. Georgia has no waiting period. South Carolina has a 24 hour waiting period once you apply for a license. In Georgia and South Carolina there are no blood tests required. If either or both persons have ever been divorced, they must bring final divorce decrees. South Carolina marriage license expire within a certain time of obtaining them, whereas a Georgia license has no expiration date. 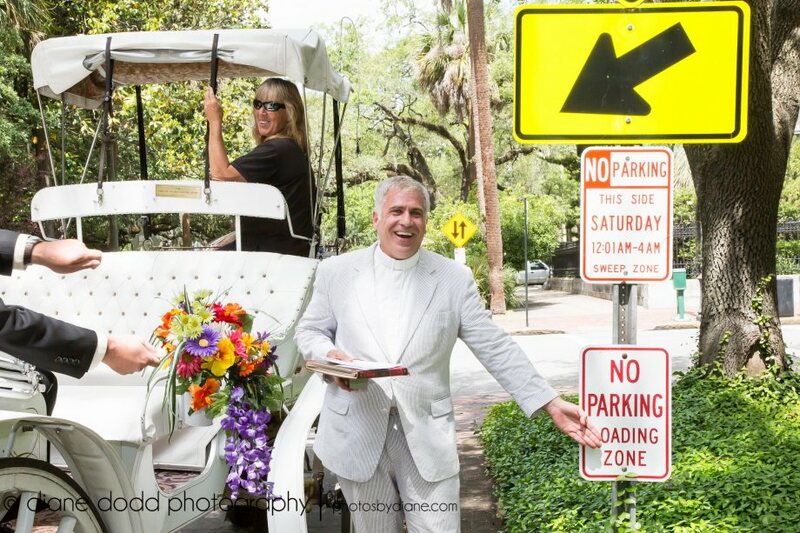 Who would have thought 18 years ago that Savannah would become one of the top 3 places in the country to get married? Not me, but that’s what we have become, IMO! 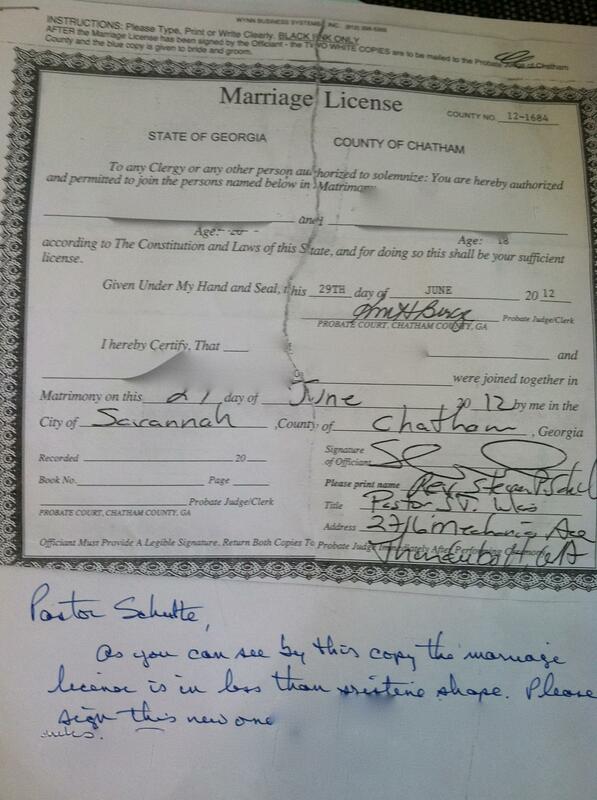 One question I get asked is “what do we do with the marriage license?” Here’s a recent photo I took of the piece of paper that is stapled to the marriage license that is given by the Chatham County Probate Court. Chatham County Probate Court License Info. As a bit of a reminder: if you live out of state, you must get your marriage license in this county; if you live in GA, you can get your marriage license from any county; and, you cannot bring a marriage license from another state and use it here. Also, you’ll need two forms of gov’t issued ID with at least one of them being a photo ID. Please call them at 912.652.7395 if you have questions. The marriage license in this county: they will give you three carbonless copies, attached at the top. The blue copy is for you to take with you, the other two copies get sent or taken back into the courthouse. Or you can take it back in to the courthouse and have it recorded on the spot. If you live in state, you can get your license from any county. One of those other questions is really strange: Are you related? In Georgia you can’t marry your same gendered partner but you can marry your first cousin!